In the Genesis myth of chapter one, the breath (spirit) of God hovers over the primordial waters – the one element in creation that is co-eternal with God (so technically not a creation). God says, “Let there be …” and therewith issues forth light followed by the rest of the cosmic order: the dome of the sky with its sun, moon, and stars; the salt seas, freshwater rivers, and rain stores above the clouds; then comes the fertile disk of earth itself with its flora and fauna and, at last, the first humans standing squint-eyed in the radiant splendor of it all. Now if we take the view of biblical literalists, the truth of this marvelous account lies in its factual accuracy in describing the origins of the universe and our place in it. We must think of it, that is to say, as referring to an event in the past – the very earliest past, to the beginning of time itself, whether 6,000 years ago (according to a strict literal reckoning) or fourteen billion, as proposed by modern science. Regardless, it happened long ago, and here we are. The problems with taking the Bible literally this way are numerous, but perhaps the most serious problem is that it makes the Bible into something it isn’t. When its stories are read as eye-witness records of miracles and metaphysics, they lose their power as sacred fiction and become falsifiable. Not only scientific scrutiny, but rational logic and adult common sense must be given the privilege of testing the claims of a literal Bible. In that case, the evidence and arguments against its truth (as factual accuracy) are fully persuasive, leaving a literalist no choice but to reject science, rationality, and the obvious so the Bible can stand alone as revelation. There is another way, which actually returns to the Bible some of its authority as holy writ. Before I demonstrate what I mean, by using the Genesis myth referenced above, we need to remember that these sacred stories were not originally rendered in writing and kept in books, but instead were composed and recited for audiences in settings of ritual performance. An often overlooked consequence of transcribing oral narratives into written documents is that the present-time immediacy of a live storytelling audition gets reduced and flattened to mere words on a page. Furthermore, the sacred act of storytelling – of bringing scenes and characters to life – is utterly eclipsed, leaving only the scenes and characters of another time and place, fixed and passive under the distancing control of the reader’s eye, susceptible to being skipped or reviewed as interest demands. So really we should imagine an ancient ritual ceremony where the story of creation is being performed in real time, with the storyteller speaking and gesturing before a congregation in raptured imagination. What is this myth revealing, if more than factual information about how the universe came to be? One thing, certainly, is that everything starts with God, or better, with that ineffable mystery of intention and causality to which this dry and overused name refers. We’re hearing about – or are we hearing directly from? – the primal source and creative intelligence behind the world as we know it. Yes, but not about or from something else, not a supernatural or metaphysical being – back there, up there, out there. I propose that this story is sacred because it reveals us to ourselves, as the world creators we are. My returning reader is likely familiar with my term ‘creative authority’ as referring to the achievement of self-actualization, something of an apotheosis of maturity where an individual takes responsibility for the authorship of his or her own personal myth (i.e., identity) and construction of meaning (i.e., world). Up to this point the authority has been in other hands, those taller powers (parents, guardians, and other tribal handlers) who conspire to shape youngsters into compliant members of the group. At maturity – or hopefully not long afterwards – the individual needs to step out of dependency and into self-responsible authority as a creator. What I’m suggesting is that the one who first composed the creation myth of Genesis was not doing it for the quasi-scientific purpose of explaining how the universe came into being. Obviously he or she was not an eye witness of the events described (humans don’t show up until day six), but neither is it necessary to assume that our storyteller was simply repeating what had been revealed by divine messenger. We can reasonably suppose that he was in full possession of his faculties, that she was conscious of what she was doing. That leaves us with a decision between deliberate deception (but only if we must take the story literally) and artistic insight into the creative process. I’m going with the latter. We need to be reminded (and then double-check the text for ourselves) that according to our myth the primordial waters is the one thing God did not create. (This insight resonates with the theory of Thales of Miletus, in ancient Greece, who was likely a contemporary of our storyteller.) The ‘formlessness and emptiness’ that preexists creation can be found in many myths worldwide, and it is generally taken as a metaphor of chaos – not the mixed-up confusion of random things, but rather the formless vibration of energy, analogous to the quantum reality of contemporary physics. This indeterminate potentiality of chaos rises into pattern and form in its aspect as the ground of existence, in energy manifesting as this or that, crystallized in the latticework of matter, order, and meaning. But chaos is also a solvent into which these same patterns and forms will eventually disintegrate, and this is its aspect as the abyss of extinction. As ground, chaos is generativity and fullness; as abyss it is dissipation and emptiness. Should we seek security from its abyssal aspect behind our walls and defenses, the devastating outcome will be that we lose access to our grounding mystery as well. In other words, creative authority (as well as artistic creativity) requires that we stay open to chaos and learn to trust the process. Our goal and ongoing task in any case is to live a life of purpose, which means living intentionally and taking responsibility for our choices. (It should be obvious how different this notion of purpose is from the evangelical Christian idea of a ‘purpose-driven life’, where a believer must surrender his or her will to the perfect plan of god.) And this is where three related terms come into the picture, which have not only an impressive representation in the Bible but are also found throughout the mythologies of ancient cultures: breath, voice, and word. 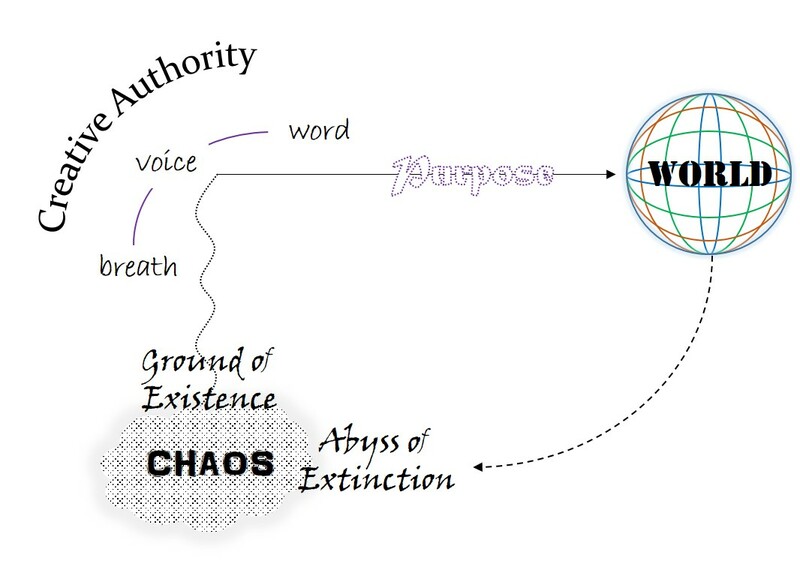 These three terms, in fact, name what we might think of as the three ‘moves’ in world creation – remembering that the construction of meaning is the end product of this creative process. It will help if we start with the product (the world-construct) and work in reverse along this sequence of moves. Word refers to speech and to the instrument of language itself, as the medium that enables the mind to facilitate the translation of experience into meaning. Pure (immediate) experience is meaningless until the logical units and categories of thought that filter, arrange, and frame it into significance are imposed. Our worlds are constructs of language – conventions, narratives, mental models – that we must continually validate by spinning the scripts that keep them suspended in our imaginations. If we should lose track of the script, as in amnesia where the neural circuitry supporting it gets bumped off-line and we forget who we are, we find ourselves in a very unpleasant place – or rather, we can’t find ourselves without a context, and that’s precisely the point. This language-dependent nature of our world is a more recent rediscovery that inspired the postmodern school of constructivism. But it’s not merely words on a page that keep our worlds suspended, but the stories we tell ourselves and others. That’s why ‘voice’ and not ‘text’ stands upstream from ‘word’. Voice is the sounding instrument that produces the word, but it cannot be reduced to the mere sound of words. Indeed, whereas words are public and shared packets of information, a voice is exquisitely individual and unique. In the Indian psychosomatic chakra system, the throat chakra is the center of personal power and self-expression. This is not about hitching onto someone else’s meaning or borrowing another’s truth, but giving ‘voice’ to one’s own perspective and will. It’s important to realize that in the Genesis myth God didn’t merely do or say something a long time ago, but is depicted (in the act of storytelling) as speaking forth, vocalizing, and articulating the structure of reality in this very moment. The cosmic order comes into being and holds together by virtue of God’s active and sustained speech; the world is words sustained in the act of speech. Our third and final move upstream in the creative process brings us to the very edge of chaos, to the threshold where the urgency of life in each breath that our body requires is channeled through the voice and into the words that construct our world. In ancient languages, the often refined idea of spirit (Hebrew ruach, Sanskrit prāna, Greek pneuma, Latin spiritus) has etymological roots in this very body-centered power of the breath to animate, inspire, pacify, and empower. Breath keeps the body alive while it serves our higher aspirations for meaning – in which, strictly speaking, the body has no interest whatsoever. A more embodied notion of spirit as breath serves additionally to keep it from leaving the body for heavenly, metaphysical, or esoteric abstractions, where it has been coined by religious orthodoxies and secret societies, time and again, into something they can claim exclusively for themselves. Even a traditional reading of the Genesis myth will tend to identify the spirit that was hovering over the surface of primordial waters with a deity who is separate and far superior to what we are. In such cases the story is enervated and its revolutionary insight into our nature as world creators is locked away. Let’s not forget, however, that worlds are constructs of meaning; that meaning is a production of words; that words are sound-bytes of speech; that the speaking voice is a channel of the breath; and that breathing is our grace between life and death. “In the beginning” is always now.